At no time in your child's life will physical changes occur so rapidly. In what seems like the blink of an eye, a tiny, helpless bundle is transformed into an active, robust and inquisitive youngster. 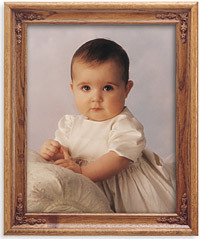 When photographed with one or more parents or siblings, a portrait at this age will capture forever that fleeting time when family members are the center of your baby's intimate world. 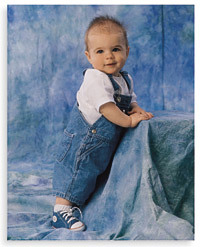 Plan to visit your photographer at least three times during your baby's first year. At Six Months . . . babies are so loveable! Cuddly and responsive, yet still dependent. Strengthened muscles let them sit up and take part in the world around them. Often happy-go-lucky, they crave attention and delight in having an audience. 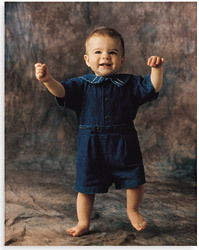 Portraits at this age are a perfect time to reveal chubby little arms and legs and even backsides! At Nine Months . . . Many babies begin to strike out on their own. Still dependent on their parents, but starting to explore an ever-expanding world . . .
well on the way to becoming a real little person and letting everyone know . . .
"You won't hold on to me for long!"